This short quiz was designed for parents and caregivers to test basic water safety knowledge. The quiz will only take a few minutes and could help to prevent a child from drowning. 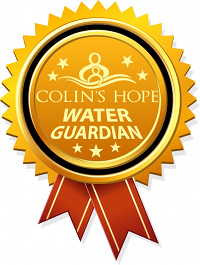 Upon completion, you can print an official Colin’s Hope Water Guardian Certificate. Please share this quiz with your family and friends. Thank you for your time. Together, we can achieve the vision of a world where children do not drown. What is the NUMBER ONE cause of accidental death for children under 5 and a leading cause for ages 1-14? HINT: This is a surprise to most adults as it was to Colin Holst's parents. Great job! Click Next to continue to the next question. Which of the following are signs that a person might be drowning? Silence. In most cases, drowning is silent. Victim cannot call for help as they are struggling to breathe. Mouth bobbing below and above water level but unable to get a breath. Body is upright in water with no evidence of kicking. May see involuntary arm movements. May look like the person is trying to climb a ladder-in most cases, they cannot wave for help. All of the above. HINT: Drowning does NOT look or sound like it does in movies! True or false, when near or in water, ALWAYS assign an adult Water Guardian whose ONLY duty is to watch the kids. This adult is IN ADDITION TO a life guard who is on duty! HINT: You are not off duty when you take kids to a life guarded pool or around any type of water. Which of the following are appropriate barriers to water? A four sided non-climbable fence or wall that is at least 4 feet tall. Any vertical slats must be less than 4 inches apart. A self closing and self latching gate that opens AWAY from the pool. A properly fitted pool/spa cover that meets safety standards and can hold up to two adults and one child in the event the child needs to be rescued. All of the above. HINT: You must ensure not just one barrier to water but multiple in case one or more barriers fail. Barriers are just one of many layers of protection to prevent drowning. Who should learn to swim? All people over 6 months of age should take formal swim lessons. Babies can begin classes (with an adult) at 6 months, children of all ages and adults. Only people not afraid of water. No one. HINT: No one is drownproof. You are never too old to learn to swim and babies can learn water survival skills very early. Which of the following should you do if caught in a beach rip current? Stay calm, don't panic and try to conserve energy. Do not try to fight the current or swim into the current. Try to swim alongside the shoreline (parallel to the shore). Once out of the current, swim towards the shore. If you cannot get out of the rip current, float on your back or tread water. Once out of the current, swim towards shore. Don't panic if you cannot reach the shore. Try to be seen! Face the shore, wave your arms, and scream for help. All the above. HINT: Read ALL the answer choices... they could save your life. And then teach anyone you know who goes to the beach. What is the best choice of a flotation aid for weak or non-swimmers? Water Wings/Floaties. Pool noodles. Properly fitted U.S Coast Guard approved life jackets. Air filled inflatable tube. HINT: Air inflated water wings and tubes can easily slip off or deflate causing the child to sink. The U.S Coast Guard knows best. Which of these water sources are drowning hazards? All pools (backyard, kiddie pools, community, above-ground and in-ground.) All open water (lakes, rivers, oceans, creeks, drainage ditches, ponds, streams, puddles.) Toilets and washing machines. Bathtubs, buckets and puddles. All of the above. HINT: You can drown in an inch of water. ALL water is potentially dangerous. What are good ways to be safer around pool drains? Do not swim at all. Only swim in open water where there are no drains. Teach children to stay away from drains, regularly inspect pool drains to ensure covers are in place and not damaged, know how to shut off the pool pump, tie back loose hair, do not wear swim suits with any loose/long pieces. HINT: Colin's Hope believes that it is important to be safer around the water while having fun. You can be safer around pool drains by doing a few simple things. True or false, all caregivers should know how to perform CPR.